Thanks for sharing, Sabrina. Well spotted and a great caption, too! Beyond its obvious lean-in feminist message, the ad is interesting because of its choice of language. As you may have noticed, many ads displayed in public space in Berlin have moved from Denglish to English. 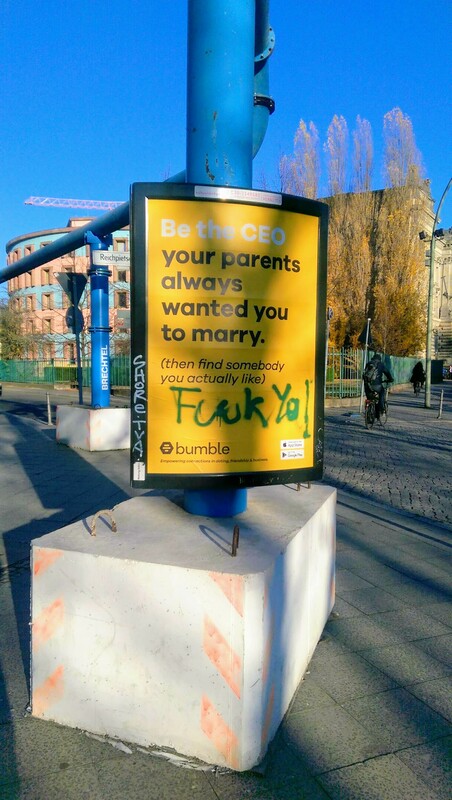 While in the case of the dating app ad we may wonder if the company simply aims to target international audiences, this recent ad, spotted by the DW reporter (and the BCB internship program alumna!) Aya Ibrahim, leaves little room for interpretation as to who its intended audience is: https://twitter.com/ayakibrahim/status/1063847562405441536.